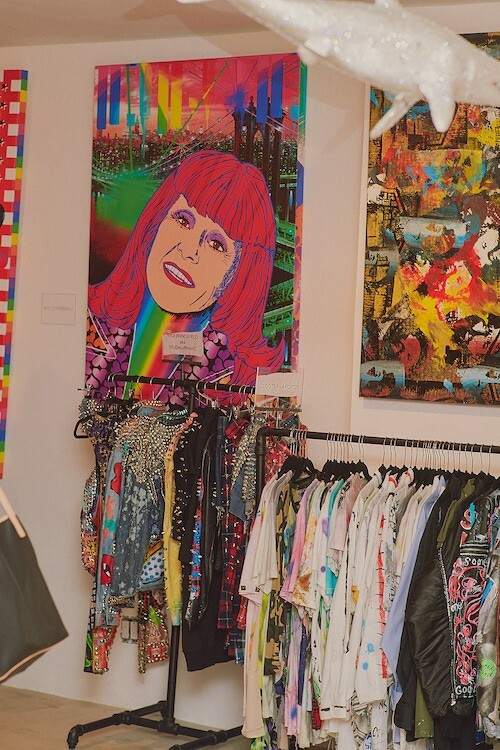 In a swirl of glitter and studs, Patricia Field opens her new ArtFashion Gallery—a place where art and fashion blend and the club kids and downtown darlings that make sure the style icon’s following are never far from the action. In some act of “only in New York” synchronicity and serendipity, Patricia Field is crossing the street as I get out of my cab on the corner of East Broadway and Clinton Street on the Lower East Side. The renowned stylist, ever the epitome of downtown New York cool, is wearing black pants patterned with geometric shapes in bright primary colors above gray sneaker pumps, her signature vermillion hair gently resting on her shoulders underneath a hunter green fedora. A fire hydrant spills water onto the street and the sun shines hot, but Field strides unencumbered by the weather. 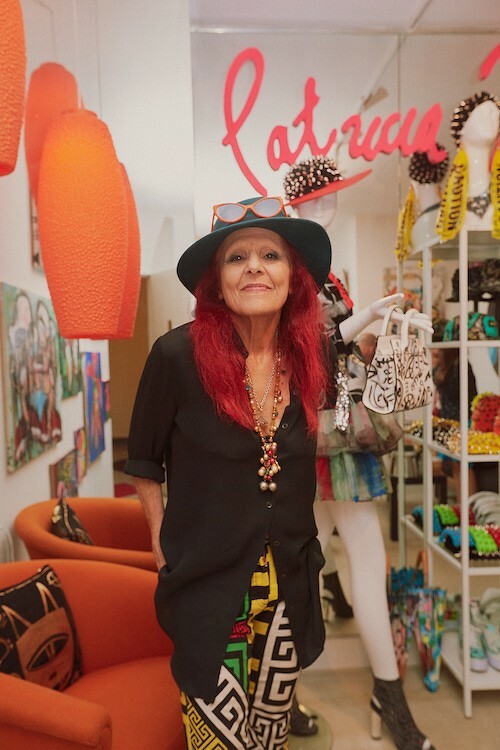 Today is an exciting day for her: she is celebrating the opening of her newest space, the Patricia Field ArtFashion Gallery. 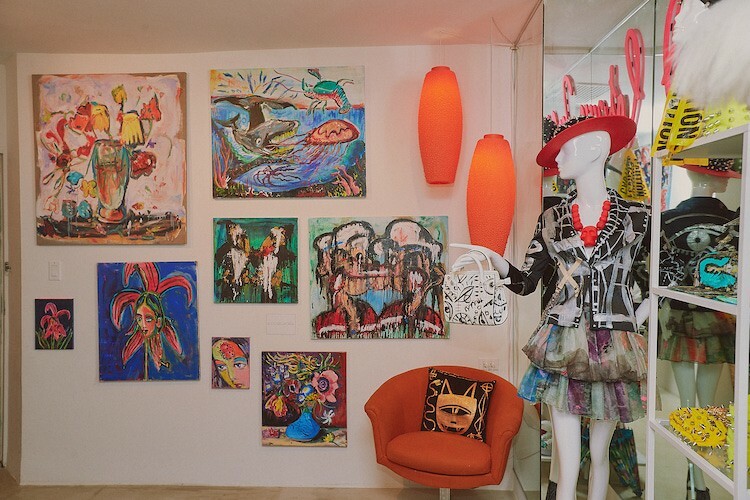 After her legendary eponymous boutique on the Bowery closed in 2016, Field quickly picked up a new project: promoting the work of visual artists who use clothing and accessories as their canvases (as well as actual canvases). For Field, though the gallery space is newly opened, the concept has been one in her stable since her days in retail before even her Bowery store. In the 1980s, her store’s Eighth Street location featured the work of Jean-Michel Basquiat and Keith Haring in its windows and on t-shirts. In ArtFashion is a continuation of that model (that also ran through the Bowery store), but on a much bigger and more purposeful scale. ArtFashion artist Kyle Brincefield, of Studmuffin NYC, embeds metallic studs into all manner of leathers and denims and even hoodies and hats and recently completed a collaboration with Steve Madden; Kristina Kiss, with her clothing line SSIK, makes clothing out of smooth-on silicone rubber and her designs were recently featured on Season 10 of RuPaul’s Drag Race (she made Aquaria’s oil-slick mermaid ensemble); Iris Bonner of collection These Pink Lips paints pieces like handbags and swimsuits and jackets with bold graphics and lettering, which have been worn by Mary J. Blige, Cardi B, and Pink, among others; and 13 other artists all contribute to the brave new fashion world Field has curated. I know where the ArtFashion Gallery is before I see it because I spot familiar denizens, attired as if they just stepped out of Field’s Bowery store, on the sidewalk in front of me: one girl wears a cyber yellow pantsuit with pristine white sneakers; another wears sky-high metallic lavender platform sneakers that match her hair with a floral jacket, her cheeks sparkling with glitter warpaint. The club kids and downtown darlings that made Field’s Bowery store an aspirational people-watching paradise for those too timid to don turquoise hair or feather boas unironically (see: yours truly) have never disappeared. Rather they’ve just been in hiding, waiting for the next hall of fabulosity open its doors so they can dwell anew. After closing her Bowery store, Field realized one of the things she missed most about it was the people. “I like being with people, it’s how I grew up. Of course the store was always a place for that and of course after the mid-80s and AIDS and whatever happened, [the art scene and art-to-wear] got commercialized,” she says. “It didn’t have that specialness anymore because the zeitgeist wasn’t there in the culture.” Clients would often come to her Bowery store and tell her it was the only place they could shop: everything else was so rubber-stamped and fast-fashion, she says. Her store was one of the few places they could find something unique, like the artist-driven, art-as-fashion pieces she displayed early on. When the Bowery store closed, Field ran with that idea. “I heard my clients telling me what they’re telling me, I’m like, ‘I’m selling my store, I’m gonna scale it back, and take what I call my hobby and create a gallery with many of the creative people that I know,’” she says. Many of the artists have worked with Field for years, like Brincefield, who worked in her Bowery store, and JoJo Americo, who has worked with Patricia Field since he was 18 years old—”I was a teeny bopper!” says this tall man with a salt-and-pepper mustache as he grabs a slice of pizza—and others like SSIK are new. “Their work is all here, let me promote it for them! That’s how all this came about,” she says. Prior to today, Field has been touring ArtFashion around the world via pop-up shops and gallery installations as well as runway shows in places like Berlin, Greece, and Art Basel Miami. Ultimately, the decision came down to continuing to tour or establishing a headquarters, and she chose the latter though she hopes to tour again at some point in the future.